Indian IT services industry grew 8.7 per cent in the financial year 2016/17, the slowest in more than a decade. However, a little-known firm based in Bengaluru reported a top-line growth of 29 per cent. It was not a mere case of the revenue base being smaller although that played a role. 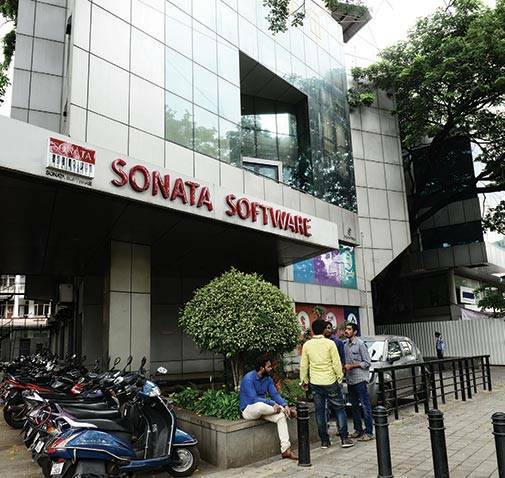 Sonata Software, the company in question, has been in the business for more than three decades. It was set up in 1986 and got listed in 1998. The company used to resell software in the domestic market and provided related services to its customers. But an early-mover advantage had not resulted in scale, size or significant success. Quick leadership changes at the top in 2011/12, when two chief executives departed within a year, meant most of the analysts had stopped tracking the company. Sonata's margins shrank, and it was making losses when a new Chief Executive and Managing Director took charge. P. Srikar Reddy, a company insider, was anointed as the next leader but by the time he had stepped in, not many thought that the company would survive. The turnaround happened, nevertheless, and if one had the foresight to pick up the stock in 2013, he/she would have been holding a multibagger now. Sonata's returns are a jaw-dropping 680 per cent (excluding dividends) compared to 40 per cent delivered by the broader BSE IT index in the same period. When Reddy came in, the biggest challenge he faced was low employee morale. Talent was fleeing the company, and there was no sales and marketing team for the global market. Much like other IT service providers, Sonata had a small international presence, but it was overly dependent on the domestic market that accounted for more than 90 per cent of its revenue. Understandably, the margins were low. Reddy decided to focus on the lucrative but intensely competitive international market. "What helped was that even in the domestic market we had extremely good relations with global majors such as Microsoft, Oracle and SAP," he recalls. Leveraging those ties to get a foot in the door, Reddy pushed things further. As a result, nearly a third of the company's revenue comes from the global market. Sonata provides a bouquet of services, including application development and maintenance, software testing, enterprise resource planning (ERP), infrastructure management, supply chain management (SCM), cloud migration, and business intelligence, e-commerce and mobility-related solutions. These efforts had a healthy impact on the bottom line. In the April-June quarter, Sonata's international business accounted for 32 per cent of its total revenue and 80 per cent of net profit. A look at the numbers tells the story even better. When Reddy took over in 2012/13, Sonata posted a consolidated revenue of `1317.29 crore and a net loss of `28.10 crore. In 2016/17, the company booked a net profit of `153.72 crore and a revenue of `2,561.46 crore. The change in the business mix has not only seen the revenue double over the past four years, but its profitability has soared as well. Early on, Reddy decided to focus on picking and choosing the battles he fought. Travel, retail and distribution (logistics) and independent software vendors (ISV) - where Sonata could roll out ERP, SCM, cloud and digital solutions of its global partners - were the verticals of his choice. To augment capabilities, Sonata has selectively acquired a few small start-ups, mainly for their technical prowess. These include Rezopia, a travel management platform; Halosys, a unified enterprise mobility solutions platform, and IBIS, a supply chain software provider. "Each cost us less than a million dollar, but they did add to our technical capabilities, and we have been able to build upon those to cross-sell and up-sell to our customers." Reddy is now helping new businesses with digital transformation so that they would succeed quickly. Sonata calls it 'platformation' whose four key pillars are open standards, data-driven intelligence, scalability and a partner-based ecosystem. Those opting for its platformation can choose from ready, accelerate or custom package. Customers could use Sonata's intellectual properties or IP (under the 'ready' bunch of service) or those of its partners (under 'accelerate'). Those looking for 'custom' will have the solutions tailor-made for them. Sonata has already deployed some solutions using platformation, and Reddy believes that the strategy will ensure even greater margins going forward. He points out that the company already earns about 20 per cent of its revenue from its IP solutions, and the number is higher than most of its larger peers. Here is one case in point that shows how Sonata plans to increase its revenue per customer, based on comprehensive, value-added services. When a leading ANZ (Australia and New Zealand) rail operator asked the Indian firm to upgrade its reservation system, it came up with a customised travel SaaS (Software as a Service) offering, based on its IP. Now Sonata manages all its services, schedules, inventory, fares and rules as well as its multichannel booking engine - be it the Internet, call centres, station booths or agents. It even offers a dynamic shopping cart with ancillaries like hotels, transfers and other activities while ensuring financial data integration at the backend. Sustaining the current pace of growth may not be easy without being future-ready. Sonata is investing heavily in its 3,575 employees to ensure that they have the necessary skills as cutting-edge technology changes are taking place across the IT services landscape. Around 10 per cent of its people have been trained in design thinking, and more such training is being planned. Such employee-friendly measures have also brought down attrition from 23 per cent to 14 per cent over the past 12 months. With the return on capital employed and the return on net worth in high 20's, shareholders, too, have reasons to be happy. However, IT services is a scale game. Is Sonata still an attractive player as consolidation seems to be taking over across the globe? "I always believe that focussed players, especially those who can add value, will be around even if they are niche ones. I am more focussed on our strategy of growing our international business and our IP-led offerings, even as we consolidate the domestic market operations," says Reddy. Some analysts are also gung-ho about Sonata's prospects. HDFC Securities, in a recent report, said "We like Sonata's scalable, IP-focussed business model, quality balance sheet, high RoE (return on equity) and high dividend yield and reasonable valuations." Requesting anonymity as he is not authorised to speak to the media, another analyst at a brokerage house says, "While Reddy seems to have turned around the company, the climb will be harder from here. It is overly dependent on the top five customers for 60 per cent of its revenue. Even in this quarter, its revenue has dipped compared to the previous quarter. While this could be a seasonal phenomenon, Sonata may end up as an attractive (acquisition) target for one of the mid-sized players." Reddy seems quietly confident about Sonata's prospects. "I am more focussed about making us a world-class player, who adds value to customers and attracts good talent." Given the turnaround story he has already scripted, not many would dismiss his vision.